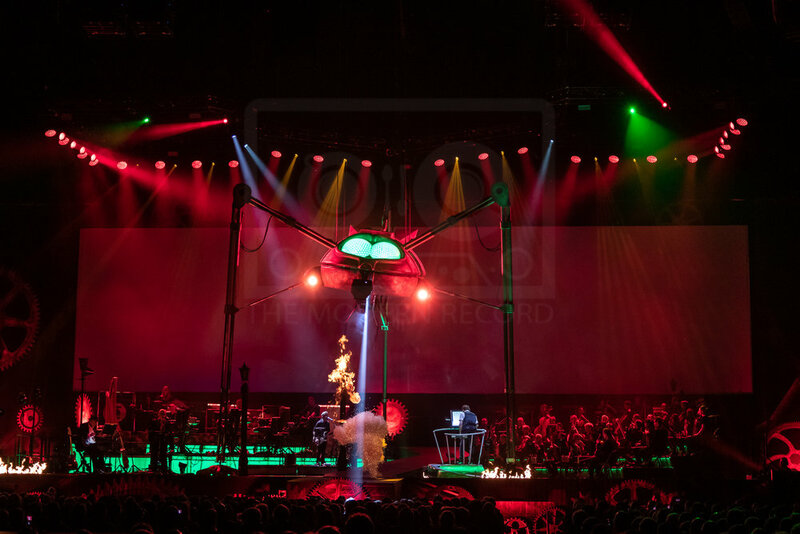 The 40th Anniversary of Jeff Wayne's Musical Adaptation of The War of the Worlds transforms The Hydro into a 19th Century science fiction nightmare, with Martian Fighting Machines and epic guitar solos. As a young child I visited the cassette drawer of my parents' entertainment unit regularly. It contained so many treasures; a selection of Neil Diamond albums; various ABC Radio compilations; a cleverly duplicated copy of the Young Einstein soundtrack; the all important head-cleaning tape and fluid pack and multiple anti-static cloths for our records. Buried in the back right-hand corner, presumably because it didn't fit the individual slots of the cassette trays, there was a double album that intrigued me for a long time. When I finally enquired with my Mum about this block of tapes - I hadn't seen a double album on tape before, it was a block - she related to me the story of how The War of the Worlds had been broadcast as a radio play in the 1930s and caused mass panic, even alleged suicide, because people thought an alien invasion was taking place. I found that story absolutely terrifying. From then on I regarded that double album with a kind of universal fear that I couldn't even understand. I must have been about 10 or 11 years old the first time I felt bravely curious enough to listen to that album. The album was, of course, Jeff Wayne's Musical Adaptation of The War of the Worlds: Not nearly as terrifying as an American radio play adapted from H.G. Wells original invasion novel. Or so I told myself. You know that way frightened children rationalise with themselves about the dark? "There's nothing to be afraid of" I told myself as the notorious "Ullas" sounded. I nearly survived Tape 1, Side A before turning it off. I made several more attempts but couldn't get my stomach beyond the notion of that chorus; "But still, they come!" When I was a little older, maybe 14 or 15, and in the prime of my teen horror film phase I discovered this album again in the record collection of my best friend's parents. Late one Saturday night while sleeping over with a couple of other girl friends, after a binge of scary movies, we decided to put it on. This time I got all the way to turning over to Side B and was just about to drop the needle when one of the others girls interrupted, "Do we have to? I really don't like it; it's scary." We let it go for the night and later, when it was just me and my best friend, we played Side B. But by the end of that we were bored. The musical themes were still dramatic and frightening, and the narration eerily haunting, but in the light of Sunday afternoon it just didn't seem as interesting. It was a long time before I revisited TWOTW, it was on the same long haul flight where I first listened to Mike Oldfield's Tubular Bells in full. I had some time to kill. In the confines of the plane I drifted in and out of consciousness and in and out of the nightmarish commentary. When I eventually came around for a meal service the album was somewhere in the middle of its third or fourth repeat, so I can definitely say I've played it all the way through. In my memory though it's still a terrifying listen. Even the titles of the songs/chapters give me chills; one mention of a "heat ray" and I get that sinking feeling in my stomach. There's no question in my mind: It is a masterpiece! A truly haunting masterpiece. Never in all these years did I imagine seeing a live stage production of something that so traumatised me as a child. Yet, when the 40th Anniversary arena tour was announced I knew I needed to see it. 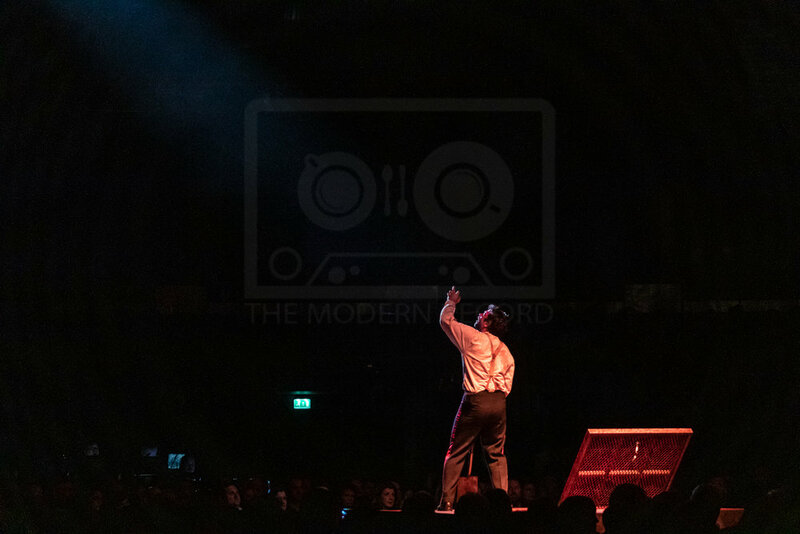 I could think of no better way to experience this album than in a vast chamber with enormous light and sound capacity, surrounded by an audience of thousands. Yes, this would be the perfect environment to conquer my fear of the "Fighting Machines". I had no idea what to expect and for my own enjoyment, or perhaps torture, I didn't look into the previous stage productions. I wanted to engage with the performance, fresh and naive, like I had done with the album. And really, I did. At first the simplicity of the set appeared disappointingly dull. A ramp from the back of the stage running between two lamp posts lead the actors into position in front of the band, string orchestra and conductor, while a secondary stage in the centre of the arena was bare. However, as my eyes adjusted to the contrasting light from the large screens behind and on either side of the stage I began to see the finer details. 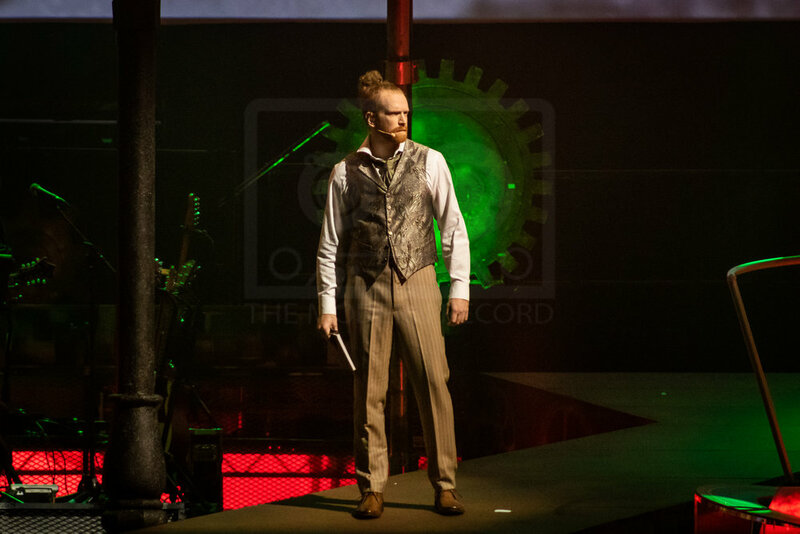 Giant cogs, metal discs, scaffold railings, beams and pillars, adorned the stage surrounds with an industrial charm. The musicians were often silhouetted but occasional highlights would reveal some glamorous fabrics. The cast, as they featured one-by-one, or at times in pairs, were all fully characterised by their respective wardrobes. And the visuals projected on the screens were loaded with detail and stimulation, particularly fitting to the pace of the narration. In some moments of intense action the density of the production was nearly overwhelming; there was so much to take in. A street scene of destruction featuring "Jeff's Music Emporium" was one of those moments where your eyes could have been watching anything and you would have seen so much, but missed so much at the same time. As it turned out the scale of the set was just right for The Hydro. The measure of this was when the Martian Fighting Machine descended upon the stage, unleashing fiery blasts, the heat from which could be felt across the entire stalls and beyond. I have to be completely honest; my jaw hit the floor when I saw that thing coming down! My heart rate was already elevated from the tension of the story; the unscrewing of the first cylinder, the panic at the use of the heat ray; seeing a life-sized alien craft standing right before my eyes was quite extraordinary. I may have lost my breath for just a moment. The accompanying sound too, was beyond my imagining. I could physically feel the landing of each cylinder, every explosion, and the Thunder Child certainly lived up to its name. The bone-melting cry from the Martians was enough to induce prog-rock sci-fi nightmares for at least another 4 decades to come. Musically I couldn't fault the performance and the engineers really controlled the sound well. Original session guitarist, Chris Spedding, and bassist, Herbie Flowers, delivered their iconic parts with incredible vitality and effortlessness. I can imagine some fans of the original recording might be put out by the addition of new music (Life Begins Again was introduced in the 2014 production) but I'd like to think fans of this musical style, and the way the story develops through the music, can appreciate Jeff Wayne's desire to grow his work and legacy through the evolution of the live performance. As the show went on I became increasingly conscious of the wonderfully effective synchronicity between light and sound; not just in the obvious and violent moments, as in the flashes of destruction and battle, but through the more passive sequences too. The heavy stillness on stage as the alien red weed covered the landscape was so subtle but so crucial to the changing atmosphere at the beginning of the second act. The darkness over the band during the Forever Autumn Reprise duet created a magical moment between just The Journalist, the endeared narrator, and his distant fiancée. Having said I didn't know what to expect going in, I was familiar with many of the performers, and I was still really impressed. 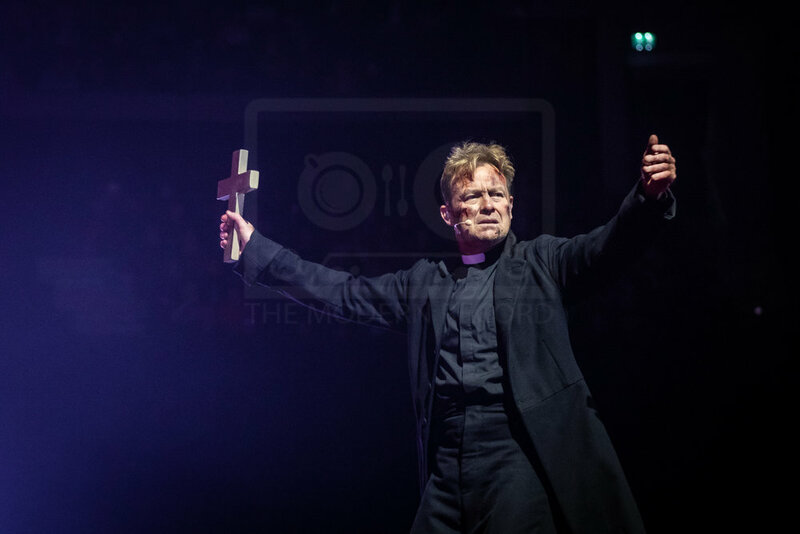 Jason Donovan portrayed the grotesque anger and distressing confusion of Parson Nathaniel to the point of apparent fatigue. I was exhausted by the end of his frantic ravings. Playing opposite the delightful airiness of Carrie Hope Fletcher really emphasised the conflicted rage of his character; the two were dynamically juxtaposed brilliantly. I found Adam Garcia as The Artilleryman a little bewildering at first, not that he didn't embody the shell of a man gone to war with aliens, but that he didn't in any way sound English at the first encounter. It wasn't a major drawback because he really nailed it when he returned in the second act. 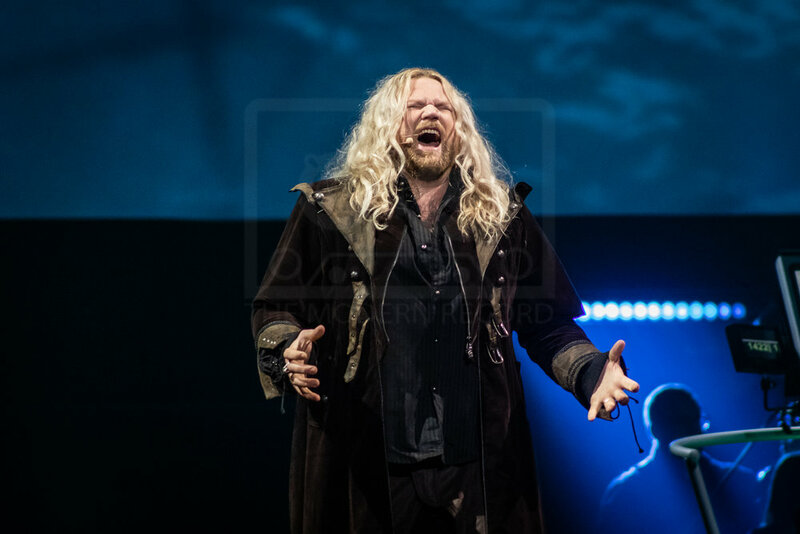 His high note phrase - "We'll start all over again!" - was perfect every time. Absolutely smashed it! His physicality was admirable too; he really worked to make his contribution immersive for the audience. Running through the crowd at first, and later summoning and scaling a bridge across the stalls added so much human energy to the overall performance. The story shifts pace up and down throughout but the final resolution still feels hastily simplistic. The spectacular demise of NASA in the epilogue does well to offset this by concluding with a rather deliberately darker message than the narrator himself delivered. After all that had gone on I felt uneasy. Later as I was leaving I overheard a woman telling a friend how her Dad had banned her from listening to the album when she was young. Apparently she played it all the time and it gave her nightmares. I would love to have been so defiantly brave as a kid! Her friend admitted "It still scares me" and the woman replied, "Me too; I won't sleep tonight". I slept alright actually.